Acronis Backup Cloud is a safe, scalable, hybrid cloud solution that protects all of your systems and devices, anytime, anywhere. 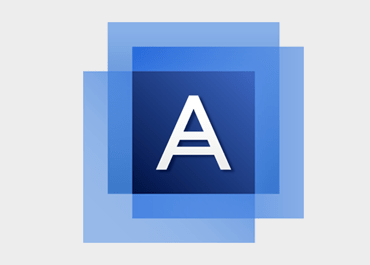 Highly customizable and cost-effective, Acronis provides backup, disaster recovery and secure data access for SMBs and enterprise clients. Acronis solutions include physical, virtual and cloud server backup software, storage management, secure file sharing and system deployment. And it’s the ultimate protection for Microsoft Office 365 email, contacts, calendar and attachments. The world’s easiest and fastest data protection for all data on-premises, in remote systems, in private and public clouds, and on mobile devices. Protects 15 platforms from a single console, supports four data encryption standards, delivers 15 second recovery, and is trusted by more than 500,000 businesses worldwide. Use intuitive cloud-based web console to reduce IT workload. Effortlessly access console from any browser, on any device. Provision complete protection in a few minutes with just a few clicks. Quickly recover to varied hardware and bare metal with proven Acronis Universal Restore. All Physical, All Applications, All Users — For any user using any device including Windows PCs and Macs, laptops, desktops, mobile. Encrypts data, in transit and at rest, protecting against unauthorized access. Choose to store your data in tier 4 certified Acronis Cloud Storage Data Centers. Acronis Backup Cloud plans offer limited storage space that can be used for storing your online backups, versions of synced files, virtual machines or applications. There is a capacity for every need from starting capacity of 10GB up to 1TB storage to accommodate all your solutions storage requirements.